A perfect capture of when a player is excited to use their character’s skills. Start with story-driven guidance: The first thing I want from a skill system is a clear indication that the DM should start with the story. The DM should understand how to describe an open evocative scene, so the players naturally are compelled to respond with what their PC will do. Foster imagination: The ideal skill system is imaginative, with PCs describing what they want to do, the DM responding within that imaginative framework, and only once the potential has been explored are dice rolled. Reactive rather than prescriptive: The system should encourage imagination, so it should react to what a PC does rather than prescribe what will work. Separate failure from assistance: Players should not be punished for trying something, especially when it isn’t their competence area. The ideal system knows when a skill check was an attempt to help, rather than a roll deciding total success or failure. Failure is story: Failures should be according to the scene, and have story-building repercussions based on that scene. The current playtest packet on one hand tries to revolve around ability checks. On the other hand, it introduces a list of skills tied to backgrounds. Additionally, under each ability the packet lists relevant skills. The result is conflicted. We want to use abilities to drive open action (a Wisdom check) but we have this list of skills (Spot). The result is that the player and DM can approach the game very differently. Even different players might approach the game inconsistently. It seems that under the new model the core is driven by ability checks. Each background provides Areas of Knowledge (bonuses to Int checks to recall lore), Proficiencies (broad set of expertise, such as dealing with watercraft), and Benefits (advantages a noble might have in dealing with the nobility). Lists of skills, as found in 3E and 4E, would be part of an advanced module. Going back to the goals I listed earlier, the Legend & Lore model could work well with a few changes. 3E and 4E led by its skill list. Skills like Diplomacy or Intimidation drove player action. Skill Challenges in 4E provided a success-failure system ultimately encouraging PCs to act only with their most highly trained skill or otherwise stay silent. D&D Next should work to undo this, bringing us back to early open and imaginative play. 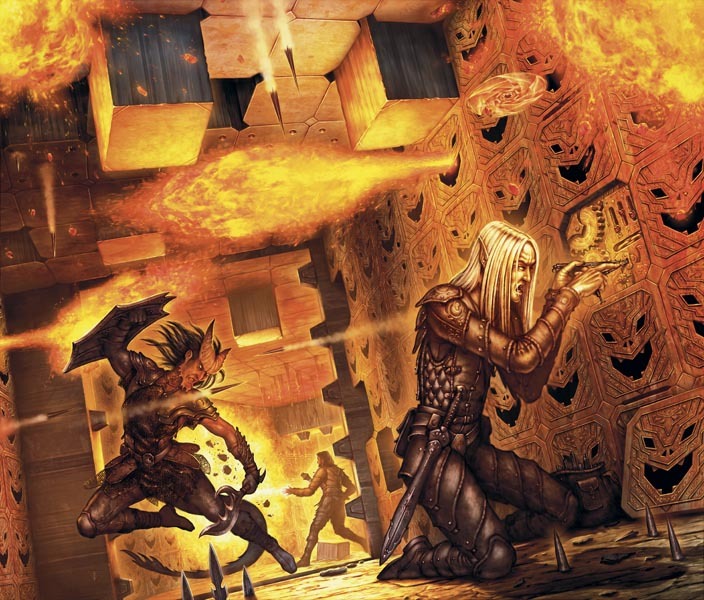 A scene like one of the entrances to the Tomb of Horrors should result in experimentation and wonder, not shouting out the biggest skill you have and rolling the die. We need great guidance to encourage the right kind of play. We also need play examples (similar to those in AD&D core books) that showcase the benefits of the suggested play style. In play: The DM should understand how to create an imaginative scene. The players should think considering their own approach and that of their PC, then discuss courses of action with the party. When a noble accuses the party of breaking an important city law, the first response shouldn’t be just for the PC with the highest Charisma score to roll the dice. It should be for the party to consider things, discussing both amongst themselves and with the noble, fluidly, while possibly trying several approaches to deal with the situation in a fashion that will ultimately be memorable and lead to more adventure. Critical component: The information should not be just in the DMG. Players need to understand the system, see examples, and be encouraged to apply it correctly. Worth considering: It is worth asking whether D&D should have some teeth here to drive this. Various indie RPGs provide incentive for this kind of play, or have mechanics encouraging it. The idea of failing forward or calling aspects, are both ways to promote PC action outside of the highest bonus. D&D could experiment with a system based on backgrounds, perhaps activating them in some way or rewarding their use. XP could be granted in various ways (when failing, when participating, when presenting new options, for a team that worked creatively, etc.). The character sheet becomes a lot simpler when we remove skill lists. The abilities, an iconic part of D&D, are front and center. Backgrounds provide the player with story-centric ideas on expertise. The first playtest packet used at D&D Next / Winter Fantasy in 2012 used a similar system. In play: The DM presents a situation (a noble accuses them of breaking the law). The players can simply react and describe what they want to do. They might also draw upon their background. The PC with the nobility background will know common lore about the laws and how the nobility thinks, and could perhaps call on favors to help with the situation. A PC with a relevant proficiency (such as forgery) could find an alternate approach. Critical component: The Backgrounds stimulate play, rather than confine it. DMs should envision various outcomes for a scene, allowing for additional options to develop during play. Story should drive play, with PC actions being critical to how events unfold. Failure is story; a skill is not an on-off switch but a gateway to results to which the DM and story react. We need both teaching and mechanics (or a system) to help take DMs design compelling scenes where PCs will use skills imaginatively. 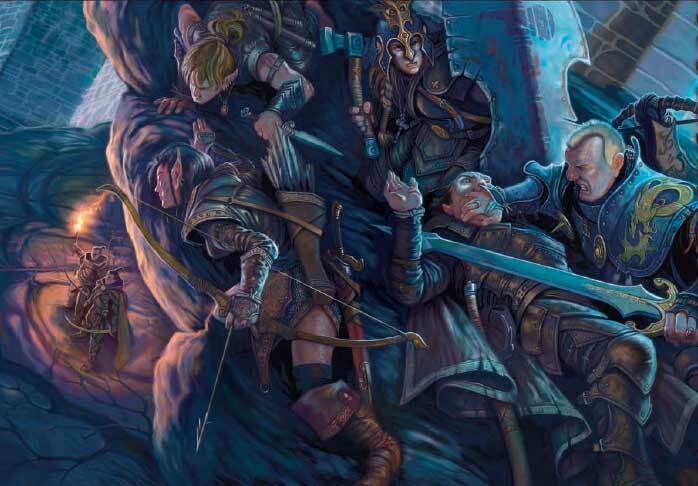 3E often created a few common scenes (convince an NPC with diplomacy, disarm a trap, use lore to solve a puzzle, use brawn to help overcome an obstacle). In each of the scenes one PC would do the majority of the work. The result was often determined by a single roll, and the PC was almost always the most skilled. Failure was usually when an extremely low number was rolled. This created jarring situations where a player role-played a perfect diplomatic negotiation, then rolled a 1. 4E added the Skill Challenge system. By using a list of skills, it created reasons for more PCs to participate. The diplomatic scenario might involve other skills, such as History, Streetwise, or the all-too-common “use Endurance or Athletics to prove how mighty you are.” An x successes before 3 failures system meant that there was some pressure and excitement. However, the failures were often meaningless – since the PCs had to cross the desert, failure stripped them of a few healing surges rather than change the story significantly. In both cases, the outcome was predetermined. Exact tactics (“I show them the emblem of the noble we work for” ) didn’t impact things outside of minor bonuses (+2 to the roll) and didn’t shape the outcome. The result was a mechanical feel, similar to a board game. Roll, move to the next encounter! It would be great to see D&D Next create a different story-first framework revolving around the scene’s goals and possible outcomes. The goal might be to extricate the party from legal troubles with the noble, but the outcomes should be really story-heavy. The party flees rather than face justice, and is wanted. However, this earns them the support of a faction in town, who help them lay low and traverse the back ways of the town. Future actions could restore their standing or brand them permanently as outlaws. The party is sentenced, and could be jailed or found innocent depending on previous actions and further events while awaiting trial in jail. Perhaps the jail holds another sentenced individual, but this one has useful information furthering the story. The party is jailed, leading to adventure within the jail. There might be a revolt, or someone might spring them from jail (revolutionaries, or perhaps another noble or the king, based on a great need). The party avoids jail, but the noble is convinced they are guilty. The noble has become an enemy. The party avoids jail, and the means by which they did so creates an ally within the city. The party avoids jail, gaining notoriety for their calm demeanor. They are invited to a party by the nobility, gaining them information towards their current quest. These are presented as suggested outcomes. Events during play can create new outcomes, perhaps using the ones above as guidance. When writing published adventures, the above might all lead to very short scenes, but could then lead back to a common place (the next step in the quest). Critical component: The framework encourages open play by helping DMs envision different outcomes, all which can impact the story. This helps DMs tremendously with the creation of rich exciting adventures and helps players feel like their ideas and actions matter (they do!). Lots of room for more: There is a lot of room here for additional design. A simple core system of goals and outcomes could be fleshed out within the advanced skill module to incorporate more of the ideas from indie games (fail forward, for example) and to provide ways skill lists can be fresh (fostering ideas) rather than stale (reducing decisions down to shouting out a skill). Allows players to customize their characters, defining narrow bands of expertise associated with core areas. The system in 3E was particularly helpful for defining a player character. A PC could be a master tracker, achieving skill results no other PC could possibly achieve. Skill ranks forced choices during character advancement, as precious ranks were allocated to create specific strengths rewarded during play. 4E smartly reduced the number of skills, but also flattened the possible math to keep PCs relatively close in talent. Ideally, D&D Next learns from these systems, providing the right granularity to create interesting choice and definition while avoiding excessive sub-categories of the same thing. Spot and Listen, Open Locks and Disarm Traps… those should be examined to see whether the differentiation is beneficial. Potentially, the advanced module could suggest a core list and provide options for home campaign use, though that makes it less likely players will experience a common game experience when they play in different campaigns. One way to deal with that is to tie all individual skills back to the Core System’s Proficiencies or Areas of Knowledge. At the very least, this might allow DMs and players to understand both systems. It could possibly even allow players to choose either system and play at the same table. In Play: The Advanced Module provides a list of skills that is the right granularity. Each skill is tied to either a Proficiency or an Area of Knowledge. A PC might have an Area of Knowledge around the Sword Coast, while another PC has assigned ranks to Lore: Baldur’s Gate, Lore: Candlekeep, and Lore: Misty Forest. The first PC has their ability in all associated checks, plus a flat bonus. The second PC has a higher bonus, but only in the specific areas (and perhaps a lower bonus in related checks). Critical component: The advanced module should not be so granular that PC choice becomes frustrating (as it was for a 3E rogue). In addition, the module should not be so different that it confuses the players who move from the core system to a campaign using the module. Neither system should be obviously superior. D&D once was a very open experience. The scene was described and players reacted, driving story. The story was often weak, but has been fleshed out nicely by many other RPGs. D&D has progressed the mechanics in various ways, developing skills into systems for character definition. However, this was often at the expense of story. Those two advances can and should be brought together to help us realize the goals of skills, but also the goals of D&D: imaginative story-telling, communal play, creativity, and the like. Sneaking up on guards and planning an ambush can bring several skills into play in exciting fashion. This entry was posted on October 20, 2015 by Alphastream and tagged 3E, 4E, 5E, Backstory, Character Building, Playtesting, RPG History.